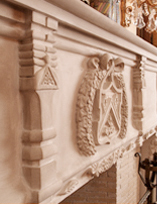 Atelier Jouvence creates the finest hand-carved limestone and marble fireplaces, range hoods, fountains, staircases, columns and capitals, and more by blending art, precision, and personal service. Flawlessly crafted in our Chicago studio, our products can be shipped anywhere in the U.S. or worldwide. We work exclusively in natural stone – a strong, unique material that provides a legacy for future generations. You no longer need to settle for a mantel or range hood molded out of pre-cast concrete or stone composites. 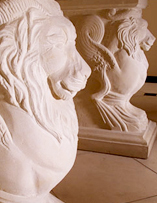 Invest in the value and beauty of stonework hand-carved from the finest French limestone or Italian marble. Recognizing a need for elegant, affordable stone carving, Master Stone Carver Olivier Dumont has designed an extensive and diverse array of stone fireplace mantels, in styles ranging from Gothic to Modern. By offering a variety of work in standard dimensions and standard stone options, we can better control costs and delivery times, allowing us to produce custom quality stonework for less. 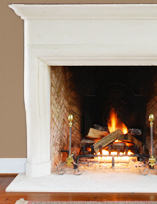 These hand-carved stone mantels are available in a variety of limestone and marble options. 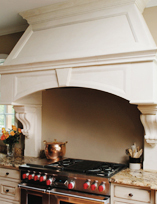 A line of standard stone range hoods is also available. In addition to our standard collection, Atelier Jouvence can custom-design virtually any type of stonework for you. In France, where Olivier was trained by some of Europe’s top stone carvers, students learn to work from a sketch, drawing, photograph, or just a concept. Whether a historic stone reproduction or a new design in any style, our Atelier (French for “artisan workshop”) will produce work completely faithful to both your original vision, and established principals of classical design. We welcome commissions for fountains, entries, columns, balustrades, tables, and any other type of architectural stone carving.